My oldest daughter wanted to have a Robin's Nest. This is for something special that is coming up. For now I will stick with the actual nest. As much as I love sewing, I have also discovered a new love, crocheting. I decided to use this new skill that I am learning to create the eggs and nest. 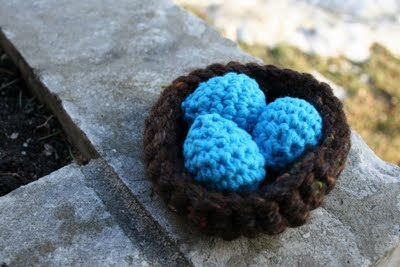 I looked around the internet and found plenty of patterns for wonderful crochet eggs, unfortunately they were all about the size of a chicken egg, not what I was looking for. So, I set to work at creating my own pattern. If you are interested in making this little nest, here is the pattern that I came up with. Let me know if you spot any mistakes, this is the first time I have written a pattern. Note: I did not like the way the eggs looked when I stuffed them with polyfill, so since the eggs are small I stuffed them with the yarn that I used to crochet them. Rnd 7: sc2tog, skip st, sl st in next 2 st and fasten off. Weave in ends. Make as many as desired. Unfortunately, I do not have an exact pattern, but this will work beautifully. If I make another, I will keep track of my stitches. Hold 3 strands of yarn together for a tight stitch. Rnd 1: ch 2, work as many sc as you can into the ring (I had 7 - this will depend on the thickness of your yarn). sl st into top of ch 2. At this point, I began crocheting in a continuous round. Rnd 2 and on: (sc in next 2 st, 2 sc in next st) repeat until you have the width you desire for the bottom of your nest. Final Rnds: This will form the sides of your nest. sc in each st until your sides are the height you desire. Last Rnd: sl st in each st around. Fasten off. Weave in loose ends.